Take a journey through Central Otago’s ‘timeless land’ and enjoy 300km of challenging cycle rides on quiet rural roads that showcase the area’s vast ‘big sky’ horizons, rugged rock & tor ranges and sweeping farmland. The Challenger Series Central Otago tour is a collection of cycle rides totalling 300km that we have put together that showcase the beautiful Central Otago region. The cycling is all on gravel roads rather than trails/paved roads, with a number of challenging climbs. The riding is rated Grade 3. A good level of fitness, cycling experience, as well as the ability to change gears proficiently is necessary to complete the rides on this trip. Our support vehicle is available at all times throughout the cycle tour. Refer to our Level of Difficulty gradings for more information. 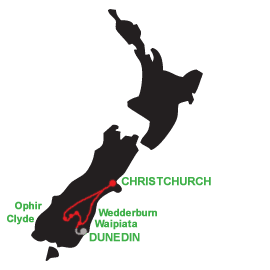 We depart Christchurch for the drive south through the Mackenzie Country to Central Otago via the scenic inland route that passes by Lakes Tekapo and Pukaki, and over the Lindis Pass. Our first ride begins on the descent of the Lindis Pass into Central Otago, to the small village of Tarras on a quiet rural road affording lovely views of the surrounding mountains. This 18km ride is a great ‘leg-stretcher’ before we continue on the Clyde in the bus. Alternatively there is the option of meeting the tour in Clyde in the afternoon from Queenstown or Dunedin, which we can organise for you. We stay in the charming historic precinct of Clyde in comfortable cottage motels. 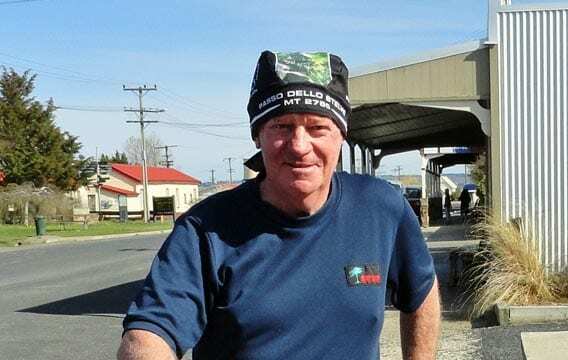 We head out of Clyde on the river trail that takes you alongside the Clutha River beneath the shade of the willow trees right through to Alexandra. From here we shoot up the Otago Central Rail Trail to Galloway. At Galloway we abandon the trail and head up into the hills on a road that dissects the Raggedy Range into the Ida Valley at Moa Creek. This climb will get the blood pumping but afford magnificent views of the Manuherikia Valley and Dunstan Mountains. From here we have a brief (optional) respite from the bikes as we head up to the Poolburn Dam for a picnic lunch. This was a location of the Lord of the Rings films and is a quaint place to spend some time. From here it is back on the bikes for the descent to the Ida Valley all the way to Poolburn. Here we load our bikes and travel a short distance to our accommodation at Blacks Hotel in the historic gold mining village of Ophir. Our ride today travels the length of the Manuherikia Valley on a terrace nestled beside the Dunstan Mountains all the way to Becks. Take in views of rolling farmland, the Hawkdun Range to the north, and explore numerous abandoned mudbrick settlements along the way. Enjoy lunch at the White Horse Hotel at Becks before and second part of the ride. Heading out of Becks, we take an elevated route across the top of a ridge providing 360 degree views of the mountains to St Bathans. Enjoy some well earned refreshments and explore the village. Back in the bus we visit Falls Dam on the way to our accommodation for the next two nights at the Wedderburn Cottages. Today we enjoy a ride that takes us right into the base of the majestic Hawkdun and St Bathans Ranges, in the upper Manuherikia Basin. It is a vast landscape of golden tussock and changing light which will leave you mesmerised. Following the ride we return the Wedderburn Cottages. The cottages are part of a working farm and there is the opportunity to meet the Duncan Family, 4th generation farmers, and learn a little about their farming operation that includes sheep, cattle and deer, as well as tourism. There is the option of trying clay target shooting too! The ride today is a tour of the Maniototo Plain. Maniototo is translated as ‘Plains of Blood’ referring to the way the rising/falling sun casts a red glow over the thousands of hectares of red tussock that was once covered the plain. Today the land is mostly cultivated farmland, though the changing light and colours will still strike you. Heading out of the cottages, we head south following the White Sow Valley all the way to Linnburn. Stop off at Clachanburn Garden, a magnificent country garden of National Significance. Enjoy a wander around the garden and morning tea. Back on the bike and it is time to tackle the climb through rock & tor landscapes through Linnburn Runs. Views of the Rough Ridge, Lammermoor, and Rock and Pillar Ranges are beautiful. We then come out onto the Paerau Valley Scroll Plain. This area is a large wetland, home to many waterfowl and trout, and the headwaters of the Taieri River. From here we ride to the town of Patearoa. Enjoy a beverage at the local pub before we transfer to our accommodation at the north end of the plain at Waipiata. Our final ride in Central Otago follows a road nestled into the Taieri Ridge to Middlemarch, with great views of the Rock and Pillar Range. After morning tea at our final destination of Middlemarch we load up and head back to Christchurch, arriving by 6pm approx. There is the option of taking a bus (or train) to Dunedin, or Queenstown instead. What’s included in the tour package? Hilary is at the helm of 'mission control', and is the person who answers your call or email. After travelling the world for several years and working in tourism on her big 'OE', Hilary came home and fell in love with NZ once again and in particular, the South Island. 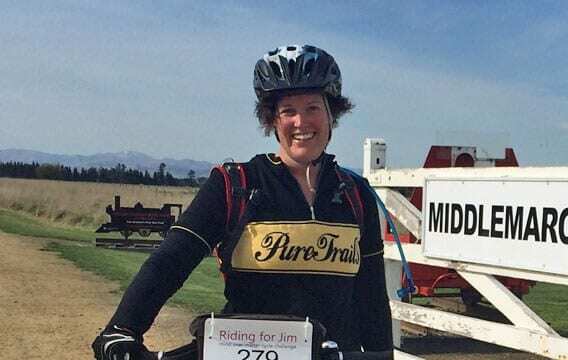 With a love of the outdoors and marketing background she teamed up with her mother to form 'PureTrails'. Hilary enjoys photography, cycling, walking, gardening, and being a mum to Josie & Sullivan.